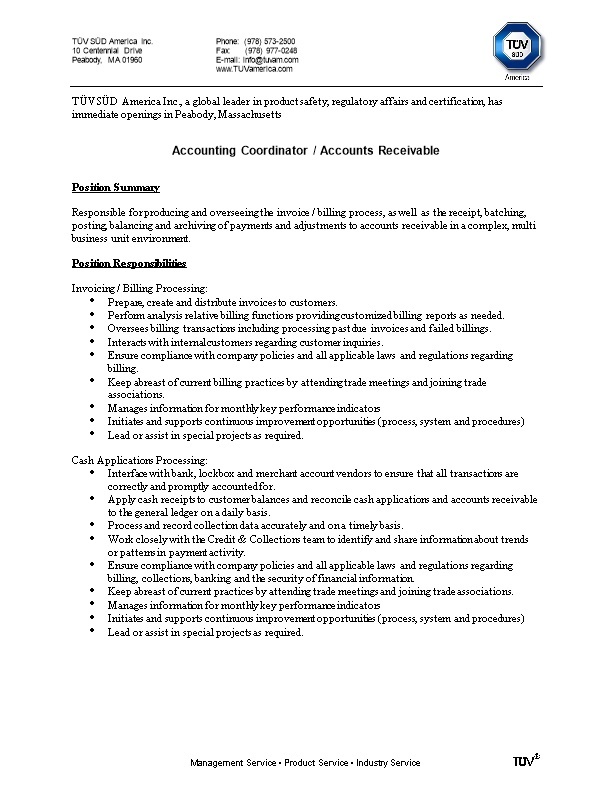 Responsible for producing and overseeing the invoice / billing process, as well as the receipt, batching, posting, balancing and archiving of payments and adjustments to accounts receivable in a complex, multi business unit environment. Prepare, createand distribute invoices to customers. Perform analysis relative billing functions providing customized billing reports as needed. Oversees billing transactions including processing past due invoices and failed billings. Interacts with internal customers regarding customer inquiries. Ensure compliance with company policies and all applicable laws and regulations regarding billing. Keep abreast of current billing practices by attending trade meetings and joining trade associations. Lead or assist in special projects as required. Interface with bank, lockbox and merchant account vendors to ensure that all transactions are correctly and promptly accounted for. Apply cash receipts to customer balances and reconcile cash applications and accounts receivable to the general ledger on a daily basis. Process and record collection data accurately and on a timely basis. Work closely with the Credit & Collections team to identify and share information about trends or patterns in payment activity. Ensure compliance with company policies and all applicable laws and regulations regarding billing, collections, banking and the security of financial information. Keep abreast of current practices by attending trade meetings and joining trade associations. We offer excellent medical and dental health plans, and participation in the company 401(k) retirement savings plan.